I was setting our table for guests when I realized almost everything was secondhand! 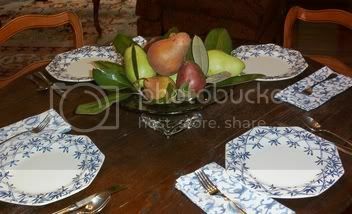 I love to collect pretty things for my table, and I enjoy it even more when I can share them with guests. Meredith, that is a lovely table! I just had to share with you about all the wonderful things I found for our older daughter (2nd of 4 children)when she married. At an estate sale, I found a 12-place-setting set of Johnson Brothers white English ironstone for $40. It was in beautiful shape and included platters, gravy boat, soup bowls, the works. I saw the exact dishes at an upscale department for $45/place setting. Then at a garage sale, I stumbled across a box of what looked like silverplate for $10, but it was pretty tarnished. This service for 8 polished up beautifully. At another estate sale, I discovered glassware from the early 50's. I bought 12 each of water, juice and sherbet glasses. It was a very simple. elegant design with a hand blown glass ball at the base. (Wish I could sketch a pic!) I paid $50 for these, but felt it was worth it for a wedding gift. So for just $100, our daughter and her husband can set a beautiful table! too pretty. Im in awe.